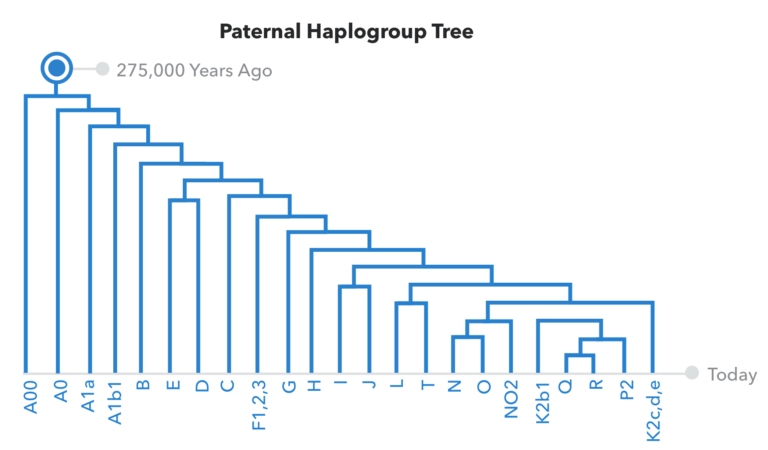 23andMe now has a new and improved Paternal Haplogroup Report. Customers of 23andMe can trace the footsteps of their paternal-line ancestors over thousands of generations of human history. A haplogroup is the term scientists use to describe a group of mitochondrial or y-chromosome sequences that are more closely related to one another than to other sequences. The term haplogroup is a combination of haplotype and group. Paternal haplogroups are families of Y-chromosomes that are defined by specific sets of shared mutations. Geneticists can use patterns of Y-chromosome variation to trace significant events in human prehistory, such as the migration of people to the Americas or the expansion of agriculture from the Middle East. 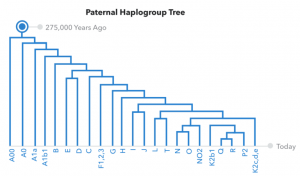 23andMe points out that your paternal-line haplogroup describes how your lineage is related to all the others. If you are a genetic male, you inherited your Y chromosome – and the genetic markers it contains – from the unbroken line of men in your paternal lineage. Researchers have compared the genetic markers in Y-chromosomes from men all over the world. They built a genealogical tree of all the paternal linages. The tree goes back more than 27,000 years to one man who lived in East Africa. He is the most recent paternal-line common ancestor to all humans living today. Major improvements in technology have helped geneticists learn more about paternal haplogroups. One example is the origin and spread of haplogroup R (the dominant paternal haplogroup in western Eurasia.) In the early 2000s, the available evidence suggested that men bearing haplogroup R reached their prominence after surviving the last great peak of the Ice Age. Recently, researchers used DNA that was extracted from the remains of men who lived in Central Asia and Europe thousands of years ago. They were able to connect the recent spread of haplogroup R to men who swept down from the steppes only 5,000 years ago. People who are genetically female do not have a Y-chromosome. As such, 23andMe is unable to directly determine the haplogrpup of their paternal line. That being said, a genetically female 23andMe customer can link accounts with a brother or father to receive their paternal haplogroup results.